You’ve been so determined to lose weight that you’ve decided to do the responsible thing and start watching every calorie. Perhaps you’ve even spent some bucks on fancy gear that tracks your calorie intake or downloaded an app to your phone that stays with you through every bite you take, watching you like a strict matron of calories. You step on the scale in hopes of seeing that magical number you’ve been dreaming about, only to discover that the scale hasn’t budged an ounce — or, worse yet, that you’ve gained weight! How could this be? Isn’t losing weight a matter of science? Fewer calories in, more calories out, you reason, should lead to weight loss. You are absolutely right — losing weight is a matter of science. And while counting calories may seem logical, in reality it can lead to diet disaster. Let’s check out why this is so. Counting calories often leads to anxiety over every bite taken. You may feel a strong sense of failure when you eat more than your daily allowance. This, in turn, produces stress hormones that encourage cravings for junk food. And, since you’ve already gone over your daily limit, you reason that this diet day is pretty much shot, so why not make the most of it and pig out on what you really want to eat? This type of extreme thinking is exactly what leads to diet disaster. 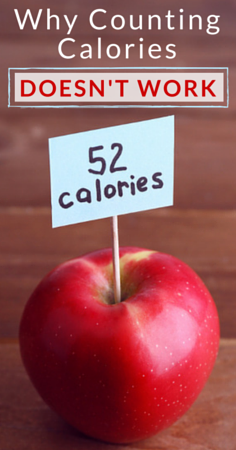 You may think that losing weight is merely about taking in fewer calories than you use. And, to a certain extent, that is true. However, thinking that that is the only factor in losing weight is short-sighted. There are many other elements involved in successfully losing weight and keeping it off. For instance, hormones play a huge role in your metabolism, as do stress and even food allergies and intolerances. If you’re not approaching weight loss as a whole-body health issue, even if you do drop a few pounds, they are likely to come back. Pop quiz: Which has fewer calories — two slices of bacon, or half an avocado? If you answered “bacon,” then you are absolutely correct. And if you’re focused on calorie counting, then you’ll choose the bacon. However, by choosing the bacon, you miss out on some critical nutrients that are provided by the avocado, as well as healthy fats that actually boost your metabolism. The lesson? Calorie counting may work in the short term, but sustainable weight loss is accomplished by eating a nutrient-rich diet. If you’re watching every calorie, it can be tempting to save your calories for occasions when you know you’re likely to pig out. You may eat meager portions throughout the day, only to gorge yourself on the items you love — such as alcohol, potato chips, or other unhealthy food choices. This sort of yo-yo eating doesn’t make full use of your metabolism. Your body needs a steady supply of energy to achieve a steady metabolism that will encourage weight loss. The bottom line about weight loss is that there’s no speeding bullet. To see sustainable improvements in your weight and health, you must make changes slowly. And they must encompass your health goals as well. That’s why we’ve created the “Lose Weight, Gain Energy Plan.” This 30-day program is designed to help you make small changes at a pace you can handle. And it does it with no calorie counting and no chemical-laden drinks or snack bars. It’s 30 days of healthy weight loss goals delivered, in manageable portions, straight to your inbox. Ready to get started?